Every mexican food restaurant has several versions of cheese enchiladas on the menu. Of course, whether you are fixing tacos, burritos, or enchiladas, you need to have a tasty sauce. Here is a quick and easy to prepare vegetarian main course including a recipe for the enchilada sauce that is equally delicious on beef or cheese enchiladas. Combine cheese, garlic powder, salt and cumin; set aside. Heat cooking oil in heavy saucepan. Add onion and garlic, saute until soft. Add tomato sauce, chili powder, oregano, cumin, and salt. Cover and simmer approximately 30 minutes. When sauce is finished, pour about ½ cup into 9” x 13" baking dish. Reserve remaining enchilada sauce in the pan for dipping tortillas. In small skillet, heat enough oil to generously cover bottom of pan. Briefly fry one corn tortilla in hot oil to soften, dip in enchilada sauce, coating both sides. Lay the tortilla flat, place approximately 1/3 cup of cheese mixture down center, roll up, and place seam side down in the baking dish. Repeat procedure for each tortilla. Lay rolled up tortillas side by side in the baking dish. Pour reserved enchilada sauce over rolled up tortillas to cover them. Sprinkle remaining cheese over all. Add chopped or sliced black olives on top of cheese if desired. Bake finished cheese enchiladas 20 - 30 minutes at 350 F until cheese is melted and bubbly. Prefer beef enchiladas instead of cheese enchiladas for your main course? Want more great cheese enchilada recipes delivered to your inbox? 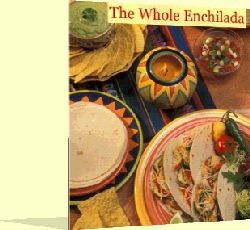 My free E-zine, The Whole Enchilada does that and more! © 2004 - 2005 Strong Commitment LLC . All rights reserved.